The year is 2047. Seven years after a global war has devastated mankind, the apparatus of the old security state has rebuilt itself into an even greater monster: the Strata State. But there’s a difference–The Outzone. A choice too dangerous for most to consider. Not Frank Brogan. When three Outzone bandits cross into New Haven and murder his wife and daughter, Lieutenant Frank Brogan quits his specially-trained police unit to hunt them down. Leaving the safety of the Strata State, Brogan enters the Outzone–a quasi-sovereign tract of land ceded from federal jurisdiction–and travels to its de facto capital, Winter’s Edge, where he picks up the bandits’ trail. In a violent city controlled by rival gangs, he needs to use all his hard-won skills as a police officer and war veteran to survive. It isn’t long before Brogan’s quest takes him out of the city and deeper into the lawless territory. Can he survive encounters with the nomadic tribes that roam the Outzone’s mountains and plains to finally confront the men who murdered his family? 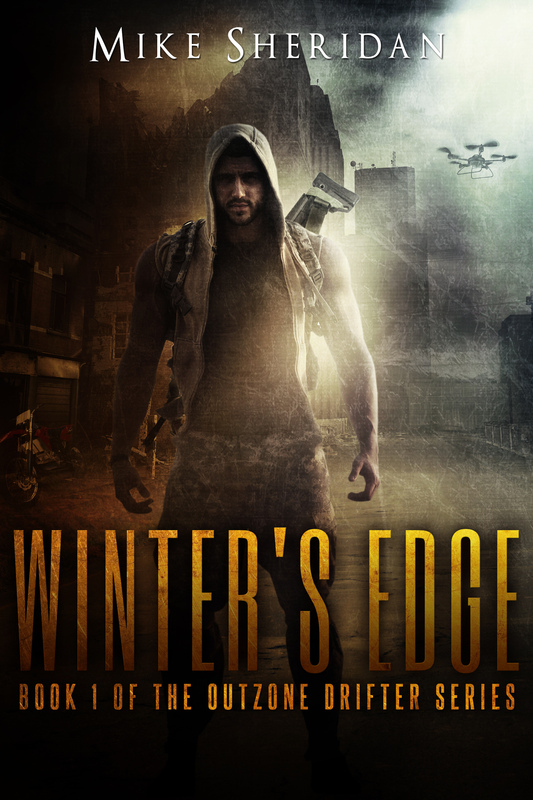 Set in a convincing post-apocalyptic world, Winter’s Edge is a fast-paced thriller that explores the contrasts between New Haven’s authoritarian Strata State and the Outzone’s dangerous and fragmented society. This story opens with a news clipping about the murders of a mother and daughter, Sarah and Jessica Brogan, at the hands of three Outzoners. They are survived by husband and father Frank Brogan, a lieutenant in the New Haven police force. Frank elects to abandon his job in the police and head into the Outzone in search of the murderers. This story really comes alive once Frank hits the Outzone. His time spent in New Haven within Strata State carries scant details. We don’t really get a sense of the actual environment within which he moves. But we do gain an understanding that it is relatively hi-tech in some ways. The Outzone, by contrast, is low-tech and gritty. A relatively lawless region in the American Mid-West (or thereabouts), it is largely run by tribes, clans, gangs and oficinas. For some people fighting and dicing with death is part and parcel of their way of life, while others find ways to live a more peaceful existence. I really liked that we met people on both sides during the course of the story. I’ve discovered lately that I often have a pervading image that runs through my head while reading a book, and this one is of semi-arid desert, with small, low bushes and plenty of rocks and pebbles visible inbetween. Of course there were areas the characters go to that were vastly different from this – this is just what got stuck in my head. An excellent debut in the post-apocalyptic dystopia genre, with clear depictions of events and a compelling main character in Frank who one roots for throughout. There is also a well-defined group of secondary characters, each of whom plays an important role in the story. I thoroughly enjoyed reading Winter’s Edge, and look forward to more from Mike Sheridan. Minor spoiler: There was one moment of violence in the book where Sheridan caught me off guard. I’m used to reading violence (prefer reading to watching), but this was sheer genius. Took me a while to recover from it too. Kudos to Sheridan for that one! For fans of post-apocalyptic and dystopia. All books reviewed on this site have been either purchased by the reviewers, or submitted by authors or publishers for review without charge. No compensation has been received for any of the reviews or the outcomes. Each book review is the objective opinion of the respective reviewer, and the property of the reviewer.